Whether still life, portrait, fashion, advertising, or artistic photography. Often images aren’t produced spontaneously, but rather created using specific production techniques. That doesn’t just involve technical know-how, but also skill in developing ideas and realizing them using state-of- the-art knowledge in digital development. As a graduate of the Photography master’s program, you’ll be in the perfect position to think conceptually and realize your ideas using knowledge of the most modern technology for artistic or applied work. 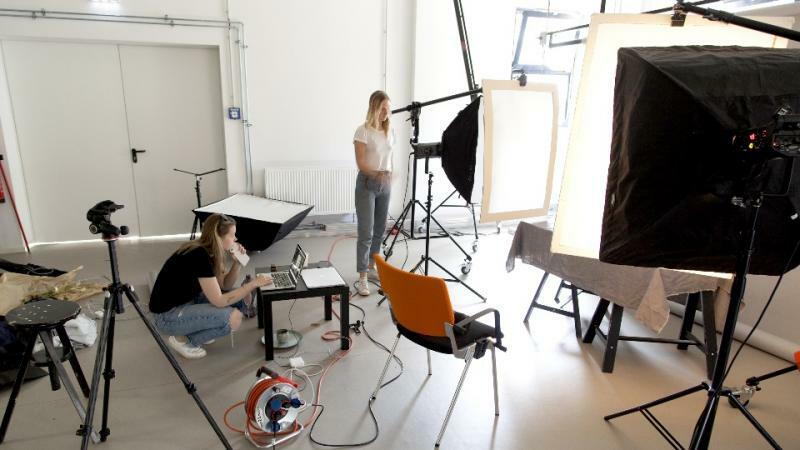 The master's program at the University of Applied Sciences Europe is one of the first in Germany to have recognized this need and offer photography at a master’s level. One of the most important elements to successfully studying photography is the ability to experiment and further develop your personal style. To offer you precisely that, our campuses have an extensive range of media technologies on offer. These include a green screen studio, fantastically equipped photography studios, an analog darkroom, scanners, printers, editing rooms for film technology, as well as sound studios. Students have the opportunity to borrow various analog and digital camera systems, professional lighting, and other technical accessories so that they can work on their projects off campus too. Our university focuses on your development. That's why we teach in small learning groups and in a friendly and personal atmosphere. We’ll oversee your individual development process and help you define your talents and strengths, while helping you develop your own visual signature. You will be taught by renowned photographers and study at a campus that is centrally located, equipped with the newest technology and that is known for its international and English-speaking character. At the University of Applied Sciences Europe you even get the possibilty to actively shape your studies and your career path. Depending on your personal career goals, you will select your own specializations and choose from a range of interdisciplinary subjects. The programs taught at our university also include practical projects with top partners from the creative industry, field trips and workshops, which will prepare you perfectly for your dream job. Sommerrundgang und Absolventen-Ausstellung des Bereichs Art&Design sind Highlights an der University of Applied Sciences Europe. Im Video bekommt ihr einen Einblick, wie die Ausstellung 2018 am Campus Hamburg vorbereitet und umgesetzt wurde.